Readers may be perplexed by the fact that this post is dated to Feb. 9th, but only just appeared today, Feb. 11. This is because we have been facing our very own Techno-geddon. Hardware, software and even web hosting turned against us for a couple of days there, but we emerged victorious. If you tried to visit the website yesterday and, well, couldn’t, that was due to our (and our web server’s) Techno-geddon. We’re back, though, and have a lot to show you! Below that, in the lower left corner, is her Annabella’s Cowl. Made with the yarns originally used by the designer in the color “Mighty Redwood”. 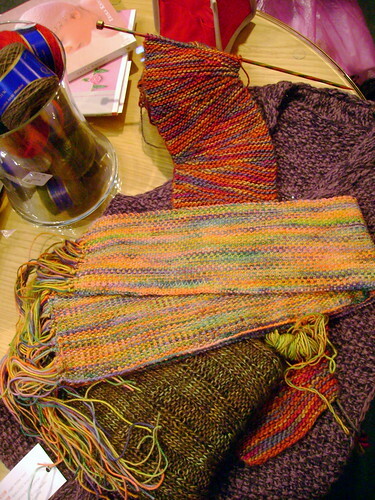 At the very bottom of the pile is her in progress Wavy Scarf, using Schaefer Helene in the color “Renata Tibaldi”. Sandra is definitely going to have a warm and stylish neck this year. Let’s see, what else has been happening in the midst of Techno-geddon? Well, have you seen that we now have FREE SHIPPING?! It’s true. Get free Priority Mail shipping with a domestic order over $75. If you’d like to read all the specifics, see our Online Ordering FAQ’s page. Admittedly, we are a little geeky here (hence our staff obsession with Knitting: 19th Century Sources). But this magazine is absolutely packed with traditional and historic patterns from around the world. 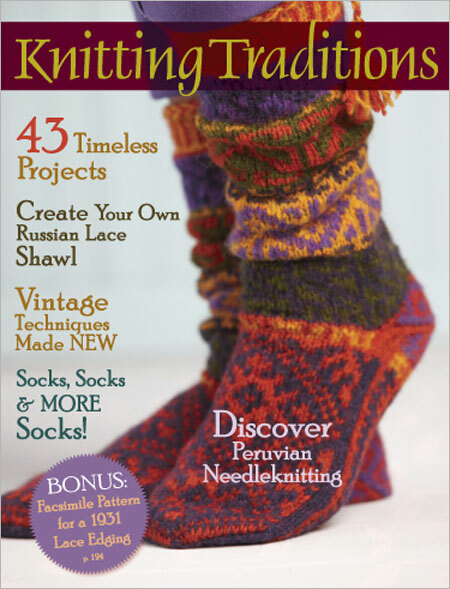 We just received 15 copies (for all you other knitting geeks out there!) and, well, 3 have already been reserved by staff members and Marj is even talking about using one of the patterns within as her Knitting Olympics challenge. And, while on the topic of the Knitting Olympics, are any of our blogfans participating? I’m slowly managing to convince my co-conspirators coworkers to try it this year. I’m thinking of making the attempt. What about you? Are you interested? If so, what’re you going to make? But we’ll let you make that determination for yourself. Until next time, barring another Techno-geddon, happy knitting! And look out this afternoon for another edition of Fashionknitsta. The post Techno-geddon appeared first on Knit Purl Blog. © Copyright 2019 Knit Purl.